The IE-NETs project is pleased to release a new working paper, the detailed report on Work Package 4: Investigating the Role of Negative Emissions Technologies in Deep Decarbonisation Pathways for the Irish Energy System (Barry McMullin and Paul Price, March 2019). As indicated by the IENETS WP1 assessment of National Carbon Quota (MCQ) pathways for Ireland (Price et al.2018, Chapter 8) and largely borne out by the modelling developed in this work package, Ireland’s (prudent, minimally equitable) NCQ is likely to be exhausted by 2023-2025, tacitly committing to some level of NCQ overshoot dependent on nett cumulative CO₂ emissions thereafter. The overall structure and evolution of Ireland’s energy system will therefore need to change and decarbonise very rapidly to limit the scale and duration of such overshoot, lest effective reversal of it becomes infeasible. This is the essential physical consequence of good faith commitment to the Paris Agreement. Sufficient carbon dioxide removal (CDR) using negative emissions technologies (NETs) would then be needed to return to the NCQ level within a very few decades (assumed in this report to be by 2100 at the latest). Cost effectiveness analysis of alternative energy system transition options for national energy and climate plans should therefore account for the full aggregate costs of long-term strategies toward fulfilling the Paris temperature objective (EU 2018, Article 15:3(b)). These costs need to include risk averse estimates of projected negative emissions reliance in terms of technology and the uncertainty attached to policy reliance on NETs such as BioEnergy with Carbon Capture and Storage (BECCS) and Direct Air Carbon Capture and Storage (DACCS) that are not yet proven or available at scale. Carbon commitment analysis of policy and modelled energy system pathways to evaluate their likely cumulative CO2 outcomes (nett and gross) is therefore essential to economic and feasibility assessment of the alternatives that do plausibly meet the Paris-aligned NCQ. This work package investigated modelling options that could complement energy system models currently used to guide policy-making in Ireland and potentially provide useful additional insights into Paris-aligned energy system decarbonisation. The outputs from such coarse-grained modelling are not comprehensive and all quantified results presented should be treated with due caution as outputs that are only indicative of the overall mitigation outcomes of the particular scenarios. Nonetheless, the modelling outputs clearly indicate serious carbon commitment concerns and critical risks related to alternative scenarios and sketched the possibility-space of energy system change constrained by a Paris-aligned carbon quota, with or without use of Carbon Cpture and Storage (CCS) or NETs. Using a newly developed spreadsheet-based modelling tool, Anthem, the strong effect of CCS on primary energy options is made evident – both in limiting fossil carbon combustion emissions and in enabling permanent CDR via BECCS and DACCS to limit and potentially reverse NCQ overshoot – as are the associated tradeoffs in CCS energy penalty and requirements for large scale infrastructure investment to capture and store such large amounts of CO2. Incorporating the potential backstop economic costs of CCS options into decarbonisation analysis may well militate in favour of other mitigation options: near-term supply-side constraint (rationing, in effect) of unabated fossil fuel energy to drive more rapid deployment of non‑bio renewables and planned reductions in societal energy demand; or early deployment of other NETs including land carbon storage and Enhanced Weathering (EW) and ocean carbon storage. These findings are potentially highly policy relevant for near-term choices that will now determine the availability of energy to society within an equitable Paris-aligned cumulative carbon constraint. The over-riding advice to policy makers, and society at large, from this analysis is to act on these options without delay. A plan for sustained and substantial reductions in absolute system CO₂ emissions is required, aiming for nett-zero CO₂ emissions from aggregate energy, cement and land-use, including a period of significant nett negative emissions to cancel accumulated carbon debt following overshoot. The work package included an initial assessment of a range of freely available energy modelling tools, following which two were selected for detailed model development – EnergyPLAN and the Ireland 2050 Pathways Calculator (IE2050). These were used to examine the carbon commitment of scenarios in terms of annual and cumulative CO₂ pathways relative to the NCQ. Despite differing limitations of EnergyPLAN and IE2050, and some technical difficulties encountered in extending them usefully, it was worthwhile to examine how the “possibility space” of an energy system model is bounded by its design. In particular, working with these models was effective in assessing the embodied expert assumptions regarding deployment extent, transition timing and the inherent risks of making essentially ad hoc user choices (including our own) that may be questionable in themselves and need to be very clearly identified and logged in presenting findings. EnergyPLAN is focused on achieving an energy system based on 100% renewables (excluding nuclear), predominantly reliant for primary energy supply on variable renewables (VRE), wind and solar, with limited availability of bioenergy, enabled by access to large scale system flexibility via heat and chemical (electrofuel) energy storage at multi‑TWh y‑1 level. CCS is only relatively simplistically supported in the most recent EnergyPLAN release and BECCS is not explicitly represented. In contrast, IE2050 is designed with the intention of being agnostic toward energy system outcome, using a range of user choices for supply and demand ambition levers (including nuclear energy). However, its detailed internal design means that, in addressing any given mitigation target, it tends to favour unabated bioenergy (assuming unproblematic carbon neutrality for all bioenergy fuels), and implicitly excluding the high VRE+electrofuel alternative configurations that EnergyPLAN accommodates. Our work with these models showed EnergyPLAN’s usefulness in examining energy supply options (assuming nuclear energy is excluded) and in exploring system design whereas IE2050’s usefulness was more limited to examining demand options, particularly through changing the internal effect of some high ambition levers to find potential opportunities for plausibly increased ambition. EnergyPLAN was used to validate the Green Plan Ireland data and findings of Connolly and Mathiesen (2014) and explore the implementation of the specified transition steps in a hypothetical scenario, whereby each step was fully completed in 5-year stages. This indicated that the earlier delivery of all steps, but particularly early investment in ensuring availability of electrofuel infrastructure in combination with very large scale deployment of offshore wind energy are critical to limiting NCQ overshoot while still maintaining access to levels of final energy consumption comparable to the current system. Although useful in giving a limited assessment of the speed and extent of overshoot relative to different supply and demand policies, in the different ways discussed for each, neither EnergyPLAN nor IE2050 proved adequate to investigating substantive NCQ overshoot scenarios requiring significant and prolonged CDR from NETs. A new modelling tool, Anthem was created to provide specific additional insight on this question. Anthem is coarse-grained and schematic, based primarily on the thermal combustion emissions of hydrocarbon fuel pathways through time and any nett capture rate to storage. Despite this comparatively schematic approach, it proved effective in providing rapid carbon commitment analysis (CCA) for a variety of scenarios of carbon-based primary energy supply, with or without CCS and NETs. It yielded high-level, but correspondingly robust, insights into the annual and cumulative outcomes for energy availability to society, CO₂ (nett value, gross emissions and gross removals) and quasi-permanent CO₂ storage requirements for CDR and for CCS used for capture of emissions from cement production and continued fossil fuel combustion (FFCCS). Anthem was also specifically used to assess the energy system scenarios presented in the Draft National Energy and Climate Plan (NECP) for Ireland (DCCAE 2018). All of these scenarios indicate steadily increasing total primary energy supply (up to an horizon of 2040), without a committed or quantified use of CCS. Accordingly, they do not show a significant reduction in annual emissions, and would lead to overshoot of the Paris-aligned NCQ by 600 MtCO2 to 750 MtCO2 already by 2040. Separately, Anthem was applied to assess a Long Term Resilience Study of the Irish Energy system (GNI and Eirgrid 2018). This study envisaged increased use of lower carbon intensity methane (mainly natural gas, but including some limited biomethane), to replace the other fossil fuels currently used in the Irish energy system. The Anthem analysis shows that this would have a relatively minimal effect on emission reduction unless and until large scale CCS is also applied. Climate mitigation is usually described in policy terms of “reducing emissions” within a “low carbon transition” but this framing is becoming progressively less useful as NCQ overshoot is approached. Within good faith commitment to the Paris Agreement, the overriding climate action objective and narrative is arguably now better focused on: radical, near-term and sustained reductions in unabated carbon combustion (fossil and bio‑energy) usage to near-zero as soon as possible; and, in parallel, investing in development of sufficient gross CDR capability, made available as soon as possible, to offset ongoing gross CO₂ emissions and, in excess of that, to progressively cancel carbon debt within a very few decades by achieving nett negative emissions at least until returning to the NCQ level. BECCS and DACCS remain highly speculative technologies with uncertain costs, energy input or output, and CO₂ removal capability. Therefore, their early delivery by 2030 shown in the various scenarios assessed, represents a likely upper bound on what might be technically feasible; in that sense the outputs of this research are coarsely informative in indicating the most optimistic relative availability of carbon-based energy and associated annual and cumulative emissions between scenarios over time. Continued high, near-term fossil fuel emissions and delayed negative emissions (gross removals) will inevitably tend to lock in progressively more cumulative CO₂ overshoot relative to the NCQ limit. In all of the scenarios, the ambitious but highly uncertain assumptions of a substantial indigenous supply of bioenergy of about 40 TWh y‑1 by 2050 while meeting stringent sustainability criteria and CCS availability, allows a supply of nett-negative-CO₂ energy from BECCS which theoretically also enables a far slower reduction in fossil energy supply. However, as for the tradeoff between early unabated FF and later FFCCS, high levels of BECCS may therefore require limiting near-term harvest of forestry biomass, particularly avoiding its relative emissions-inefficient use in unabated bioenergy production, so that it can be conserved to allow much greater total carbon-based energy if or when harvest can be allocated to use in BECCS. DACCS is currently even more speculative than BECCS, likely requires large nett energy input (i.e., is not in itself a source of energy supply, but rather would result in a reduction in energy supply to conventional societal needs as DACCS deployment ramps up). Ideally, all carbon removed from atmosphere into biomass should be prevented from re-release to atmosphere. So, specifically, in biomethane pathways, the CO₂ that is present in the raw biogas, and separated during "upgrading for grid injection" should not simply be re-released to atmosphere. It can either be directly consigned to geo-storage, or used as a feedstock for P2M (producing "synthetic natural gas" or SNG by combining CO₂ with H₂ from water electrolysis using excess variable renewable energy (VRE) sources, especially wind; but in the latter case, the produced SNG should still be routed to some CCS combustion pathway to minimise CO₂ release to atmosphere. Unlike current energy projections, or energy system modelling results underpinningIreland’s National Mitigation Plan, the research in this report clearly indicates that an escalating level of climate action and intensive energy system planning is now appropriate in the very near-term to limit NCQ overshoot and deliver socio-politically manageable decarbonisation in accord with the Paris Agreement. As a matter of urgency, Irish society and its policy makers need to address very challenging near-term energy and climate planning decisions that could deeply affect economic and societal planning, with rapidly escalating future CDR costs for every year that required reduction pathways are not met. Across all modelling frameworks studied, Paris-aligned mitigation, without national CO₂ quota overshoot, would equate to achieving extremely rapid and immediate absolute reductions in near-term fossil fuel usage, at a year-on-year rate of c. 20%, falling effectively to zero within 10-15 years (c. 2030-2035). Due to the time lag of large scale infrastructure turnover and deployment, this finding remains robust even with the fastest technically plausible roll-out of fossil fuel carbon capture and storage (FFCCS). That is, a CCS “bridge” strategy would no longer be able to avoid overshoot; at best, FFCCS deployment can now contribute only to limiting the scale and duration of overshoot. In fact, on current projections and policies, including those included in its Draft National Energy and Climate Plan [NECP] (DCCAE 2018), Ireland is likely to overshoot its prudent maximum Paris-aligned CO₂ quota (estimated as 378 MtCO₂ from 2015, here denoted LowGCB:pop) as early as 2023-25, representing a tacit commitment to carbon debt and implying significant future energy system costs for large scale carbon dioxide removal [CDR] via Negative Emissions Technologies [NETs]. Due to the low current Technology Readiness Level [TRL] of proposed NETs, these costs are subject to high uncertainty. Nonetheless, prudential estimates of such costs should now properly be included in any notional cost effectiveness analyses of future energy policy interventions. In all scenarios with significant quota overshoot, deployment of NETs then becomes unavoidable to reverse such overshoot (assuming continued good faith participation in the Paris Agreement). The feasibility of doing this at required scale is highly uncertain and is likely sharply constrained by absolute cost. Indigenous territorial potential is further severely limited by bioenergy resource availability for bioenergy with CCS [BECCS], total low/zero-carbon energy availability for direct air capture (of CO₂) with CCS [DACCS] or enhanced weathering [EW], and relatively very limited total territorial CO₂ geo-storage potential (required for all forms of CCS deployment). Accordingly, even in the (likely) quota overshoot scenarios, near-term deep reduction in unabated fossil fuel use to limit the extent and duration of overshoot remains a key national risk management imperative. This suggests that, even in the short term, the finalised NECP (to be properly Paris-aligned) should show a national annual CO₂ emissions pathway to nett zero with minimum quota overshoot: that is to say, achieving nett-zero annual CO₂ emissions much earlier than 2050. Coupled with rapid reductions in fossil fuel CO₂ emissions, early deployment of BECCS could, in principle, contribute to achieving nett-zero and then nett-negative total energy system CO₂ emissions (to reverse accumulated quota overshoot). However, this would inter alia imply early prioritising of bioenergy fuel use into BECCS in preference to unabated end use in transport and small or medium scale heating. Of course this does not dilute the requirement for deep decarbonisation of the latter energy use sectors; rather it points at the need to focus primarily on strategies for those sectors which are not based on unabated bioenergy use (e.g., direct electrification and/or end use substitution with non-carbon electrofuels such as hydrogen). Projected cumulative nett CO₂ emissions in the LULUCF sector significantly impacts on quota available for energy (or, conversely, requires significantly greater cumulative nett-negative emissions in the energy sector to compensate). In parallel, early demand reduction in all sectors, and early investment in low-regret or no-regret mitigation options are likely needed to achieve sustained reductions in nett absolute emissions. Low regret energy system decarbonisation options, including large scale wind and solar energy development, non-carbon electrofuels produced at periods of excess variable renewable energy as large scale energy storage, for grid backup and direct end use in heat and transport, and limited CCS + NETs are likely all now essential components to prudent and effective climate mitigation action. 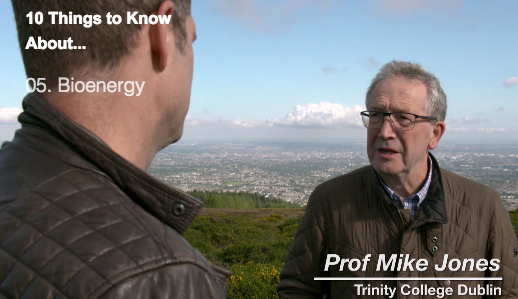 Available now on the RTÉ Player: 10 Things to Know About...Bioenergy: Prof. Mike Jones of IENETS (from 18min 30sec into the video) discussing bioenergy and negative emissions in terms of future land use policy and farming choices, in particular stressing the urgency now needed in making science-informed decisions regarding bioenergy and negative emissions to complement direct emissions reduction. In this extended blog post we will look at two, highly contradictory, reports recently released on the future of natural gas (fossil methane) and biomethane in meeting Ireland’s future energy demand within long term decarbonisation objectives. The first, McMullin et al. (2018), is a commissioned academic peer review (two of the IENETS team are co-authors) which concluded that plans to increase fossil gas dependence would be counter to Ireland’s commitment to aligning climate action with the Paris Agreement and would seriously undermine Irish long-term energy security compared to a wind and solar dominated energy system, combined with lower total energy use and renewable power-to-fuel (e.g., hydrogen or ammonia) for large scale (seasonal) energy storage. The second report, a Long Term Resilience Study (hereafter we’ll call it the LTR Study) aiming to project future gas demand and examine the security of gas supply, was produced by Gas Networks Ireland (the Irish national gas network operator) and Eirgrid (the Irish national electricity transmission system operator), at the request of the Department of Communications Climate Action and Energy (DCCAE). Contrary to McMullin et al. and also at odds with ‘least cost’ studies previously produced for DCCAE for the National Mitigation Plan, the LTR Study advocates increased gas dependence, thereby inferring a pressing need for investment assessment of additional gas infrastructure (including a storage facilities and a floating Liquid Natural Gas terminal), a significant commitment to scaling up indigenous biomethane production and continued promotion of oil and gas exploration. However, as this blogpost analysis details, the LTR Study fails to address the national energy greenhouse gas emissions implications of such increased gas use within the necessary context of rapidly decarbonising the entire energy system. This failure to address these urgent decarbonisation in line with Ireland's commitment to the Paris Agreement fundamentally undermines the report’s projections and cost benefit analysis recommendations. For the current IENETS project, projected gas supply and usage is highly relevant to aligning Ireland’s CO2 emissions and low carbon transition with equitably meeting Paris Agreement temperature targets and related global carbon budget. If projected emissions from proposed scenarios are likely to overshoot Ireland’s ‘fair share’ quota of the global carbon budget then Paris-aligned action would logically need to also include the costs of commitment to achieve planned carbon dioxide removal (CDR) from the atmosphere – using negative emissions technologies – to return Ireland’s nett cumulative emissions to its Paris-aligned quota level as soon as possible. The trailing caveat here, “within the current EU frameworks” is worth comment. Firstly, Ireland is an independent Party to the UNFCCC, so Ireland’s commitment to Paris is not solely through the EU. Additional national climate leadership by Ireland is not restricted to EU decisions and Ireland, as a full EU member state, can choose to advocate for higher EU ambition. Ireland has independently ratified the Paris Agreement and is therefore committed in any case to mitigation action aligned with meeting the agreement objectives, according to science and equity. Separately, EU frameworks are evolving such that the new National Energy and Climate Plans currently being produced by EU Member States will need to be show coherence with all relevant overarching targets, including the Paris agreement in particular. The LTR Study then describes a need for proposed infrastructure developments to improve the security of supply for gas and stresses an increasing economic importance of gas in future for electricity, transport and heating. In arguing that substantial continued reliance on natural gas specifically is critical and unavoidable (up to at least 2040) the LTR Study is very much in agreement with another report produced independently earlier this year by the Irish Academy of Engineering (IAE 2018). Good faith commitment to the Paris Agreement requires far higher emission reduction rates than acknowledged by the IAE report (or, now, the LTR Study). Displacing other fossil fuels in favour of increased use of gas will only escalate security-of-supply risk through escalating system reliance on a single fossil fuel. Prioritising early exit from all fossil fuels, including gas, is now increasingly feasible, more certain in CO2 mitigation and more secure than a “gas bridge” transition. Near-term and sustained energy demand reduction and progressive electrictrification of transport and heating would be critical to meeting a Paris-aligned pathway. Excess wind and solar periods enable power-to-fuel (P2X) production of electrofuels: chemical gas or liquid storage of energy to ensure continuous, on-demand, energy supply. All low and negative decarbonisation pathways are now extremely challenging, but rapid fossil fuel phase-out would deliver greater economic and social resilience. Therefore, increases in (methane) gas dependence, new gas infrastructure and continued natural gas exploration are not advised for Ireland’s sustainability, economic development or energy-security objectives. A key basis for these conclusions is the very limited time available for climate action given Ireland’s limited remaining CO2 quota, relative to the Paris global temperature targets. Note this is a quota allocation of total cumulative CO2 emissions because CO2 accumulates in the atmosphere to cause very long term warming. Our previous IENETS analysis concluded that precautionary climate risk management should be based on the low-end of an assessed scientific global carbon budget range, especially in light of Ireland’s significant land use emissions and high non-CO2 emissions (from agriculture) that are not projected to fall substantially. Allowing for even a minimal interpretation of meeting the “well below 2ºC” Paris temperature goal on a basis of equity, we assessed a “fair share” remaining CO2 quota for Ireland as a maximum of about 378 MtCO2 (80 tCO2 per capita) from 2015. Based on a direct emissions analysis of SEAI fossil energy supply projections, Ireland’s continuing, high per capita energy CO2 emissions will exhaust this quota and Ireland will enter “carbon debt” by c. 2025, thereafter requiring (on a basis of good faith climate action) compensating negative emissions, in order to return to the quota level. Therefore, based on this quota and current projections, all fossil and land use CO2 emissions from about 2025 onward will accumulate an increasing carbon debt or quota overshoot relative to Ireland’s good faith Paris commitments. This translates directly into an ill-defined but very high risk obligation imposed unilaterally on future Irish citizens as they must attempt to somehow reverse this overshoot by removing that excess CO2 from the atmosphere and return the associated carbon to secure (ultimately geological) storage. Further, this obligation will, by definition, may fall to be discharged against a background of severe societal stress due to intensifying climate disruption, locally and globally. Given good faith commitment to Paris-aligned climate mitigation and climate leadership, minimising this obligation, by minimising the extent of such carbon debt, is now a key imperative both for effective climate action and for protecting intergenerational trust and solidarity. Having set out a cumulative CO2 framing for energy projections analysis, let’s look in more detail at the LTR Study in terms of annual emissions and the now binding constraints of conforming (in good faith) to a Paris-aligned cumulative CO2 quota. We can examine this statement using the LTR Study projections and translate them into emissions to compare with the national CO2 quota. The study gives two scenarios of future annual gas usage, median demand and high demand, as shown in Figure 4.4 of the study, reproduced below. Using the Paris Agreement year of 2015 as a start point for long-term decarbonisation targets we can use SEAI projections for gas usage for the data up to 2024 that is missing from this chart. The LTR Study also includes a plan for rapidly increasing Irish indigenous production of biomethane. Energy from biomethane combustion is assumed to be carbon neutral under EU energy-emissions accounting and could displace the use of fossil natural gas. By charting the LTR Study gas energy projections we can then compare them with a modelled projection of notional least cost energy-emissions for the minimum ambition “CO2-80” pathway aiming for an 80% cut in emissions by 2050 compared to 1990 (Deane et. al 2013). This pathway was previously produced for DCCAE using the IrishTIMES energy system model to inform the National Mitigation Plan (2017) climate action measures. That projection (starting from 2005) gave higher gas usage in 2015 than actually came about, therefore to give an indicative comparison in the charts below we adjust the Deane et al. IrishTimes modelled gas pathway to start from the actual usage and then, from 2020, mirror the CO2-80 relative changes over time. As a result, in the chart below, we see the gas-only energy projection for annual energy from 2015 onward for these alternatives. The biomethane production projection is shown as a dashed brown line – assuming linear increases between the LTR Study data points in its Table 6.1. The total gas demand from the LTR Study Fig. 4.4, including projected biomethane, is shown by the dashed blue (median demand) and red lines (high demand). Subtracting the biomethane energy from the projected total gas energy gives the projected use of natural fossil gas for the two scenarios in the solid lines: blue (median demand) and red (high demand). Looking at this chart, the projected rise in total gas demand for both LTR Study scenarios is far greater than the modelled ‘least cost’ CO2-80 pathway, which projects a 15% reduction in natural gas primary energy supply from 2010 to 2050. By comparison, the more stringent CO2-95% emissions pathway requires a far greater 73% reduction in natural gas primary energy supply by 2050. Further, if the projected production of carbon neutral biomethane does not materialise then the shortfall in total energy from gas would need to be replaced by some combination of demand reduction and zero carbon energy sources to avoid any increase in emissions from use of fossil fuel energy, including natural gas. The corresponding chart of CO2 emissions is shown below. The brown dot-dash line shows a bioenergy credit for (temporary) CO2 removal from atmosphere , arising from the photosynthesis process in growing the biomass used to produce the biomethane, corresponding directly to the CO2 that is regenerated in subsequent biomethane combustion (normally simply returned back to atmosphere). The solid blue (median demand) and red lines (high demand) show the projected nett emissions from the combustion of all gas, allowing for the bioenergy credit. The dot-dash blue and red lines show the level of gross gas-combustion emissions for the LTR Study scenarios including biomethane consumption, but exclusive of the bioenergy credit. As already noted, EU energy emissions accounting treats bioenergy combustion as carbon neutral – any bioenergy combustion emissions are assumed to be exactly compensated by the bioenergy credit. However, a quantified carbon balance for the energy use would depend on the actual sustainability criteria and land use accounting basis for assessing the bioenergy credit. If bioenergy is supplied on the basis of a lack of enforced sustainability criteria or without verifiable, detailed land use accounting and strict monitoring of anaerobic digestion plants for methane leakage then the amount of bioenergy credit accounted to compensate for biomethane combustion emissions may need to be validated or estimated to allow for net emissions. From these annual charts it is evident that even the median demand scenario of the LTR Study describes much higher gas supply and emissions rates than the notional least cost decarbonisation pathways described by IrishTIMES cost optimisation modelling previously commissioned by DCCAE. The difference between the IrishTimes and LTR Study scenario pathways would appear to suggest the LTR Study pathways are not aligned with the notional least cost decarbonisation, even for a (minimal) 80% CO2 reduction target by 2050. Although this economic modelling has similarly been produced for DCCAE to be ‘policy relevant’ it is not referenced in the LTR Study (nor, for that matter, in the IAE’s report). Moving toward carbon quota analysis, cumulative CO2 emissions trajectories for gas only shows that, even if natural gas were the only fossil fuel in use and even if the projected carbon neutral biomethane production occurs, the LTR Study scenario natural gas usage alone would exhaust Ireland’s entire post-2015 carbon quota by about 2050. Of course, in reality, in the absence of radical, very near-term, reduction in fossil fuel use (not discussed in any material way in the LTR Study), the projected usage of oil, coal and peat, as well as gas, can be expected to exhaust the full quota even before 2025. As shown in the chart above, the natural gas usage projections of the LTR Study from 2025 to 2040 alone would then result in cumulative CO2 debt of 150 to 200 MtCO2, based on 9 to 15 MtCO2/yr annual emissions, requiring similar CDR, almost certainly dependent on using large scale geological CO2 storage, combined with either biogenic or technological removal of CO2 from atmosphere. However, the viability of such a sustained scale and quantity of negative emissions capacity would need to be assessed and costed within a full-energy-system cost-effectiveness analysis, under the constraint of meeting the required Paris-aligned nett cumulative CO2 quota. Current government climate policy (based on the National Policy Position) suggests the use of nature-based land carbon sequestration (in forest and soil) to offset other land use (mainly agricultural) emissions. Therefore, any production of bioenergy will need to result in no additional land use emissions, particularly avoiding any nett additional N2O emissions by limiting or, ideally, decreasing total nitrogen fertiliser use in Ireland. Carbon capture and storage (CCS) could possibly greatly reduce territorial emissions intensity of gas power plants by perhaps 90% assuming that investment in CO2 capture and storage infrastructure was achieved. If biogas or bioenergy combustion CO2 was captured and stored via CCS also then nett negative emissions could be achieved. The Irish Times energy system modelling for the National Mitigation Plan shows rapidly increasing amounts of gas CCS, but only from 2040 onward. Curiously, the LTR Study does not refer to CCS at all, even though Gas Networks Ireland and its parent company Ervia have been promoting the potential use of CCS for the gas-fired power stations in Co. Cork to take advantage of the geological storage potential of the now nearly exhausted Kinsale Gas Field. Estimated total CO2 storage capacity in the low pressure Kinsale field is 330 MtCO2, roughly the same as the gas-only CO2 emissions to 2050. This carbon quota analysis suggests that to meet a precautionary Paris-aligned CO2 quota, CCS is needed as soon as possible if any fossil fuel use is planned after 2025, let alone increased gas use in addition to projected oil use. Inevitably, the energy penalty for CCS and the cost of additional infrastructure (capture plant, pipelines, injection and storage) add significant cost to future fossil fuel use, particularly if all CO2 released in Ireland by unabated combustion from 2025 will need to be compensated by subsequent permanent removals from atmosphere. This framing is commonly appealed to in the energy policy community, most particularly by those holding or responsible for significant existing natural gas assets or infrastructure. However, it is potentially misleading in terms of effective climate action. Above all, climate mitigation requires ongoing rapid reduction of absolute emissions, not just reductions in the carbon intensity of the different fossil fuels (or activities). Although the thermal combustion emission intensities of natural gas (205 g/kWh) and oil (264 g/kWh) are indeed lower than coal (341 g/kWh) and peat (415 g/kWh), total energy emissions in Ireland are dominated by oil (about 21 MtCO2/yr including jet kerosene) and gas (about 10 MtCO2/yr) whereas coal and peat already account for comparatively much smaller shares (about 6 MtCO2/yr and 3.5 MtCO2/yr respectively). Therefore, although removing higher carbon intensity peat and coal from the energy supply is important, the future projected combined use of all fossil fuels is critical to any discussions of low carbon transition, including projections of future gas supply as in the LTR Study. As shown below, based on current policies and ESRI economic projections, SEAI project Ireland’s use of oil will not reduce (it may even increase) and gas use is projected to increase. Comparing with the previous charts, these SEAI projections are more in line with the high gas demand scenario. As before, the bioenergy credit is shown as negative emissions, without which the gross gas and total emissions are higher as shown by the orange and black dot-dash lines. This chart shows additional emissions from gas and oil simply replacing the projected reduction in coal and peat emissions. Total nett emissions stay more or less unchanged (i.e., even if the bioenergy credit for biomethane is included). The most recent SEAI National Energy Projections to 2030, based on ESRI modelling, now show some reductions in energy CO2 by factoring in additional National Development Plan (NDP) and oil price assumptions but, as consequential rebound effects are not assessed by the SEAI, it is unclear to what extent spending cost savings from energy efficiency and conservation might result in emissions-causing activities likely to limit nett mitigation from policies. For the same annual emissions but now looking at the cumulative CO2 emissions in total and by fuel compared to a Paris-aligned CO2 quota, in the chart below we can see Irish total cumulative emissions exceeding the national quota by 2024. A cumulative emissions pathway will only level out if the nett annual CO2 emissions go to zero, and nett negative emissions are required to then bring nett cumulative CO2 back down. The oil and gas lines continue upward because annual emissions are not going to zero, rather they are high and stable or increasing. Oil-related emissions alone are currently likely to emit a 2015-2035 total of 475 MtCO2, greater on its own than a 378 MtCO2 total CO2 quota, and gas could emit an additional 270 MtCO2 by 2035 in the high gas scenario. As this chart makes clear, single fossil fuel or single sector analyses such as the gas and electricity-focused LTR Study are, on their own, insufficient to conclude that the scenarios given are “aligned with Ireland reaching long-term decarbonisation targets”. It seems evident that near-term reductions in the Ireland’s supply and demand for oil and gas combined are needed to limit the amount of CO2 quota overshoot and the scale of the corresponding tacit commitment to achieving subsequent nett negative emissions. Therefore, all carbon emitting fuels (especially oil) and technologies must be included in energy-emissions analysis of decarbonising Ireland’s entire energy system. Based on the SEAI projections but using the LTR Study biomethane projection, the cumulative CO2 analysis shows that the projected rapid increase in biomethane production makes very little difference to cumulative CO2, even if achieved at the ambitious level suggested by the study. Although the gas energy-emissions projection in these charts is similar to the LTR Study high scenario, the median gas scenario would still have 2040 fossil fuel emissions of 9 MtCO2/year from gas alone (assuming zero nett climate emissions from sustainably produced biomethane) requiring the corresponding energy system analysis projections of oil, coal, peat and negative emissions in order to provide an appropriate decarbonisation assessment. In summary then, the LTR Study claim that its medium demands scenario is aligned with Ireland reaching long-term decarbonisation targets appears highly questionable in terms of Ireland’s fair share carbon quota and even in terms of published least cost analysis. The LTR Study’s cost-benefit analysis does not provide a comparison with the lower cost IrishTimes pathway, or include quota-alignment costs of carbon dioxide removal needed to compensate for unabated gas combustion (without CCS). Such costs would also need to include the upstream emissions related to natural gas, and the energy penalty of CCS. Similarly, the costs of assuring strict sustainability criteria for bioenergy are not stated. For example, biomethane produced from grass silage requires enforcement of limits on nitrogen fertiliser for grass growth and on fugitive methane emissions in in anaerobic digestion plants. In the absence of a whole energy-emissions system analysis, the LTR Study is too narrowly focused on gas and electricity to make this claim. It also overlooks both ‘least cost’ decarbonisation analysis previously produced for DCCAE (Deane et al. 2013) and Paris-relevant cumulative carbon budget analysis (Price et al. 2018; Glynn et al. 2018). If energy emissions reduction is indeed the imperative that it is generally claimed to be, by government and in reports such as the LTR Study, then policies must, with high certainty, deliver a near- and long-term pathway of emissions reductions. As McMullin et al. points out, there are also the costs of energy-supply risk in over-reliance on imported gas supply, and in the highly uncertain presumption of future discovery of more natural gas. Furthermore, there is the uncertain but multi-generational risk and long-term cost to our future of failing to restrict emissions in line with the Paris targets. In this context, nett zero or negative carbon energy should logically have an even higher energy and climate policy priority than short horizon energy security or current cost. Omitting costs skews cost benefit analysis, making options appear far less costly than they are within a system analysis demanding Paris-alignment of system decarbonisation. Viable options to stay within 1.5ºC or well below 2ºC are becoming ever more urgent, even with radical emission reduction and some limited commitment to nett negative emissions. As nuclear energy has been ruled out to date in Ireland and CO2 quota analysis shows continued fossil fuel dependence must rapidly come to an end, the only viable answer appears to be near-term and sustained energy demand reduction, combined with rapid roll-out of a 100% renewables energy system, primarily based on wind and solar generated electricity with a range of battery and pumped hydro for short-term grid balancing and chemical energy storage to provide seasonal or even multiannual security of supply. While the electrofuel storage element of this pathway is challenging in terms of technology maturity and immediate investment cost, this is true of all decarbonisation pathways that might credibly be commensurate with meeting the Paris climate goals; but this pathway has the unique advantages of high confidence in the effectiveness of decarbonisation and relatively rapid achievement of very high national energy security. Such a rapid fossil fuel phase out would additionally bring very significant co-benefits in balance of payments and overall national social and economic resilience. Energy and climate policy requires a broad basis for the increasingly difficult energy and climate choices society and government now have to make. To be ‘policy relevant’, study scenarios and cost benefit analyses need to address cumulative emission quota analysis and how conclusions will assist in meeting a Paris-aligned energy and emissions pathway for Ireland. Cost-effectiveness analysis, as demanded by the Climate Act and as described by the Public Spending Code, requires such a Paris-aligned “national transition objective” to be defined and met by collective climate and energy policy. Without this overarching system perspective both costs and risks are likely to be greatly underestimated by narrowly focused or short-term studies. Radical energy conservation measures to cut near-term fossil fuel use and early investments in large scale wind and solar with electrofuel back up, may be apparently expensive in the current absence of strong carbon management, but in a cost-effectiveness context aligned with meeting Paris commitments, thus requiring a national “fair share” cumulative CO2 quota to be met without fail, they may well be the optimal choice. DCCAE, 2017. National Mitigation Plan 2017. pp.1–200. Deane, P. et al., 2013. Technical support on developing low carbon sector roadmaps for Ireland Low Carbon Energy Roadmap for Ireland. ESRI e4sma UCC. Gas Networks Ireland and EirGrid, 2018. Long Term Resilience Study 2018. Pp.1–42. Glynn, J. et al., 2018. Zero carbon energy system pathways for Ireland consistent with the Paris Agreement. Climate Policy, 52, pp.1–13. Government of Ireland, 2015. Climate Action and Low Carbon Development Act 2015. pp.1–25. IAE (2018) Natural Gas: Essential for Ireland’s Future Energy Security. Irish Academy of Engineering. Jul 2018. McMullin B, Price P, Carton J, Anderson K, 2018. Is Natural Gas “Essential for Ireland’s Future Energy Security”? Pp.1–21. How much of our CO₂ budget is needed just to rebuild our energy system? Notwithstanding the notional quantitative units on the two axes, the graph is, of course, purely qualitative, but it does still convey an important heuristic insight: building energy infrastructure itself takes energy, and we only get a net energy (or energy service) “surplus” if or when that initial investment is “paid back”. Operational energy is energy used directly to provide some function or service. Thus the heat cooking food in an oven, the electricity lighting a bulb, the liquid fuel burned to produce thrust in an aviation engine are all examples of operational energy. By contrast, the energy required to manufacture an oven or a light bulb or an aviation engine (or complete aircraft) is referred to as embodied energy. Given the current dominance of fossil fuel based infrastructure in energy systems (at global, regional, or national levels) it follows that the decarbonisation transition itself will involve a great deal of embodied energy. While some of that might substitute for energy that would otherwise be embodied in maintenance or refurbishment of the existing energy system, a great deal of it is likely to be additional i.e., it would not be required but for the decarbonisation of the system. At any given point in the decarbonisation of renewable energy transition, it will be the energy system of that time, and the carbon intensity of energy at that time, that determines the emissions associated with that embodied energy. Toward the end of the transition, that intensity will have become low (by definition); but early on, it will still be very high. In effect then, decarbonisation itself involves a large scale commitment to additional CO₂ emissions, over and above emissions from all “ongoing” human activities (not directly associated with the decarbonisation transition). As CO₂ is effectively cumulative, any given climate change temperature constraint (such as now embodied in the Paris Agreement) implies a limit on the total further amount of CO₂ that can be released to the atmosphere, the so-called remaining global carbon budget. But the analysis above indicates that a potentially substantial component of this must be ring-fenced for emissions associated with the embodied energy essential to the construction of the new, decarbonised, energy system. While precise quantification of this commitment (of embodied energy and associated emissions) is difficult, it strongly suggests a need to absolutely minimise, as far as possible (technically, socially, politically), the amount of operational energy used for any purposes other than for the energy system transition, until that transition is substantially achieved. As far as I know, this heuristic system-level insight has not, as yet, been incorporated in any explicit way in practical energy transition policy (certainly not in Ireland?)... but comments/pointers are definitely welcome via our project twitter feed @ie_nets or direct email to ienets@dcu.ie. This is termed a “trilemma” to indicate that, to at least some extent, these three aspects are all in tension or conflict with each other, and pursuing any one in isolation may therefore limit or compromise delivery on the others. But all three are evidently desirable if not essential (as in motherhood and apple pie): therefore we must presumably strive to carefully balance policy interventions across all three “legs” or “pillars” of the trilemma, and avoid “unduly” focussing on, or prioritising, any one of them. Indeed, this can be seen as exactly encapsulating the whole challenge of energy policy: were it not for this tension, and this need for balance, policy would surely be (relatively) straightforward — just pursue some single overriding policy goal! Note that the WEC graphic device is subtly instructive here: the choice of an equilateral triangle to represent the trilemma clearly frames the three “dimensions” are essentially equal and symmetrical, at least as policy objectives. Again, the tacit implication appears to be that no one of the dimensions should be singled out or prioritised over the other two. Although the graphical device is different, we again see a tacit commitment to essential equality and symmetry among the three aspects. Of course, these three specific dimensions of “sustainability” do not map precisely onto the commonly cited dimensions of the energy trilemma, so the comparison is suggestive at best. I will set it aside again for now (but revisit it before the end of the post!). So: what’s the problem? If this is all so much common sense, how can the “energy trilemma” possibly be considered “harmful”? Well, the central question to be resolved is whether the three aspects or dimensions really are “symmetrical”? Or, alternatively, whether there might actually be legitimate reasons and arguments for prioritising or privileging any relative to the others? Because if they are not, in fact, symmetrical, then the call for “balanced” treatment in policy might actually be mistaken, and potentially counter-productive. And if that were all indeed the case, it would surely be important to become aware of it as soon as possible. OK, so cards on the table: my claim is that in fact, the three dimensions of the supposed “energy trilemma” are not “symmetrical”, but are actually best thought of (and pictured graphically!) as a prioritized hierarchy. While there is much background and detail that could be explored in relation to the Maslow hierarchy, the essential idea is straightforward enough. The lower levels in the hierarchy provide enabling conditions for all the levels above: that is, unless and until a lower level is attained, it is difficult if not impossible to achieve the higher levels that depend upon it. Or to put it another way: it well be an ultimate societal goal that all citizens should have the opportunity to realize their full human social, creative and intellectual potentials, but if their basic physiological needs are not yet satisfied (food, water, shelter) then first addressing those basic needs must properly override all other priorities. As with the Maslow hierarchy, the argument here is perfectly straightforward. At the bottom of this energy-needs hierarchy we place environmental “sustainability” precisely because if our energy system is not (indefinitely) sustainable — if it is not “meeting the needs of the present without compromising the ability of future generations to meet their own needs” (in the words of the Brundtland report) — then in a perfectly reasonable sense, it cannot be called “secure” (and further, its real “cost” is effectively unbounded); by definition, it would ultimately, inevitably, fail to meet any needs at all (either for ourselves or our posterity). In the case in point, if, collectively, we do not succeed in effectively limiting anthropogenic climate change (in the sense of the Paris Agreement goals of limiting temperature rise under conditions of global equity and solidarity), then organised human civilization as we know it will almost certainly become impossible. So transitioning to a “sustainable” energy system (locally and globally), which is to say, achieving zero (or negative) ongoing energy system GHG emissions within a prudent assessment of the remaining Global Carbon Budget (GCB), needs to be viewed as an overriding priority in energy system policy. Unless and until our portfolio of policy measures meets the criterion of reliably achieving sustainability in this sense, then all considerations of “security” (never mind “cost”) must be properly regarded as essentially moot. In practice this likely amounts to prioritising early, equitable, reductions in energy consumption (i.e., protecting those in energy poverty while targeting those actions and practices in society that have the most intensive and discretionary consumption profiles), while rapidly ramping down unabated fossil fuel combustion (“unabated” here meaning “without capture and reliable long term storage of the produced CO₂ pollution”) and building out energy infrastructure capable of at least zero and preferably negative nett CO₂ emissions in operation. But once we satisfy these policy conditions for long term environmental sustainability, then, of course, security becomes a critical consideration, precisely because the critical physiological and safety needs of any industrialised human society (the bottom two layers of the Maslow hierarchy) are completely contingent on ready access to adequate energy. And achieving energy security is especially challenging in a world, that, for the currently foreseeable future, will be struggling to deal with intensifying impacts from already transgressing multiple bio-physical planetary boundaries (of which climate change is only one, even if the most immediately acute). So again at this level of the energy-needs hierarchy, unless a society can have a high degree of security in its energy supply — robust in the face of potentially severe geo-political stresses — then the question of relative “cost” must still remain largely moot. Energy supply that may be seriously disrupted with little notice or control is not a basis for a stable, prosperous, society — no matter how “cheap” it may otherwise appear to be. So, subject only to ensuring sustainable energy supply, then the second most important condition for energy system policy must be achieving adequate security of supply. In practice this will tend to favour the greatest feasible “insourcing” of supply by maximising use of indigenous zero- or negative-CO₂ energy resources; and secondarily maintaining strategic reserves of critical energy carriers where technically possible. But there is essentially no scenario in which concerns over short-term security should be allowed to undermine the strategic imperative to exit from (unabated) fossil fuel use. Moreover, in the case of a country such as Ireland, with very small and rapidly depleting indigenous fossil fuel reserves, and only highly speculative prospects of any new fossil fuel discovery (which, in any case, would be likely to be high cost, both technically and socio-politically) then even abated fossil fuel use (via carbon capture and storage) can be expected to play only a small and relatively transient role in our energy decarbonisation transformation. Of course, if sustainability and security are assured, then it does finally become absolutely reasonable to judge energy system measures and policies against criteria of relative cost: we would want, as far as possible, to ensure that the required sustainability and security are indeed achieved in the most cost-effective manner possible. But it cannot be stressed too strongly that the very concept of “cost-effectiveness” becomes coherent only when the choices at hand are between alternatives that can all be considered as very likely to be successful in meeting the criteria for sustainability and security. Otherwise, cost comparisons are premature and inappropriate — comparing apples and oranges. Cutting energy system costs at the expense of compromising key thresholds of sustainability or security should never even enter in to the evaluation of energy system policy measures. So, in conclusion, I have presented my case for replacing the terminology and preconceptions of the “energy trilemma” with those of the “energy-needs hierarchy”. 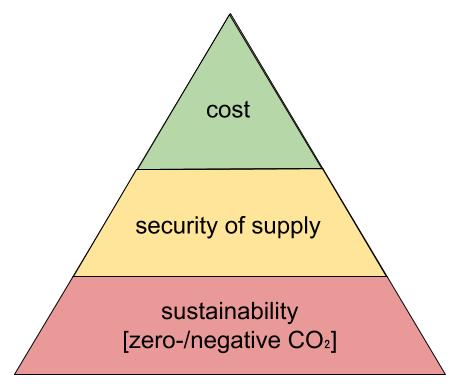 To be clear, I believe it is very useful to view energy policy through the three “dimensions” of environmental sustainability, security and cost: but I would encourage anyone continuing to use this framework to explicitly recast it into the hierarchy formulation. It is only under conditions of full sustainability and secure (largely indigenous) supply that there can be proper discovery of the true cost of energy. This is the difficulty with the energy trilemma framing. If the essentially global and long-term view of an energy hierarchy, including alignment with the Paris Agreement, is not reflected in national policy-making then it is almost inevitable that energy cost will instead prioritise near-term and local priorities by being biased toward reflecting current costs accepting fossil fuel lock-ins without internalised constraints on their total future use. The properly accounted and internalised near-term cost should still, of course, be minimised: but in general, this cannot usefully be at the expense of undermining security of supply or (even more seriously) of destroying long term environmental sustainability for generations to come. The Environmental Protection Agency, the EPA, provides Ireland’s most recent complete emission inventory data, up to 2015, published 2017 [pdf]. Comparing inventory emissions with Ireland’s core climate policy it becomes clear that about 10 million tonnes CO2e of Ireland’s emissions (on a GWP-100 equivalence basis) are not currently targeted by national policy, even though these emissions are accounted in EU targets – and do, of course, physically affect Earth’s climate system by adding to global warming. These ‘missing emissions’ are primarily from manufacturing, industry, waste and also ‘F-gases’ (used in refrigeration and air conditioning). In this blogpost, we discuss this issue and some possible implications for climate policy and policy analysis. Separately from, and pre-dating, this national policy, Irish emissions are also subject to binding EU emission reduction policies, where emissions are divided between: the EU’s Emission Trading Scheme, the ETS (from large industrial sources, such as power stations, industrial heat use and cement production); and non-ETS emissions, which are limited according to the Effort Sharing Decision whereby each nation is assigned an emissions pathway (allocated by negotiation according to different assessed national mitigation potential). For the linear, national non-ETS emission pathways each Member State is legally bound to stay within their corresponding allocated total of non-ETS emissions for periods up to 2020, and soon, under the forthcoming EU Climate Action Regulation, to 2030. However, rather than reflecting this ETS vs. non-ETS distinction, the NPP does not mention the separation at all. Indeed, it mixes them together – the electricity generation facilities are covered by the ETS, whereas the built environment, transport, and agriculture and land-use sectors are all within the non-ETS sector. Built Environment includes mainly heating-associated emissions in the Public and Commercial Services, and Residential sectors. Logically, as the NPP takes this collective approach to territorial greenhouse gas emissions, ignoring the ETS/non-ETS distinction, we can ask: Are all GHGs therefore included in the key NPP statement quoted above? Obviously they are not, some major sectors are omitted from mention altogether: there is no targeting of reductions in Manufacturing Combustion, Industrial Processes, F-gases, Waste sectors, or in Energy Industries other than electricity, including petroleum refining, solid fuel manufacture and fugitive emissions. These ‘missing emissions’ amount to a considerable 10.3 MtCO2e or 17% of 2016 total Irish CO2e emissions. See the Excel file here which includes lines below the main tables adding up these missing emissions, for example in the Provisional Summary 1990-2016 sheet detailing total national emissions. In terms of EU targets, the missing emissions add up to 5.8 MtCO2e or 33% of Ireland's ETS emissions, and 3.6 MtCO2e or 8% of non-ETS emissions. Even though these territorial emissions are ultimately covered by the EU targets it is striking that there is no mention at all of these key sectors in the NPP. These omissions are surprising as the NPP is specifically framed in the context of the aligning action with the UNFCCC objectives (now concretely stated in the Paris Agreement) and the associated European Union objective of reducing greenhouse gas emissions by 80-95% by 2050 compared to 1990. The latter EU 2050 Roadmap assumes EU-wide average reductions of ~85% in Industry and ~74% in non-CO2 (especially Waste and F-Gases) emissions by 2050, yet these sectors are not given a target or included at all in the NPP. It is very difficult to see how deep, economy-wide and sectoral emissions reductions can be achieved if significant sectors are excluded from the explicitly stated targets in Ireland’s climate action policies. This omission of major sectors from the NPP and the lack of clarity in aligning the policy position with the EU targets undoubtedly has the potential to increase confusion in Ireland’s carbon governance capable of achieving a low carbon transition, especially relative to meeting the separate ETS and non-ETS targets. Sectors outside the NPP definitions could possibly even be incentivised to grow – contrary to the need for decarbonisation across all sectors – simply because their emissions are not readily apparent to policy analysis that is primarily based on the NPP statement that fails to target them. It should also be of serious concern if some sectors of emissions are not fully included in policy analyses and projections, given that policies will nonetheless need to achieve the EU targets that do include these emissions. Several policy analyses by agencies and researchers released since the NPP are notable for charting the NPP's EGBET emissions yet failing to chart pathways for all CO2 and non-CO2 emissions, thereby overlooking emissions from the omitted sectors. Even if current national policy does not target them, objective policy analysis and projections by agencies, researchers and NGOs needs to assess the trajectory of all of Ireland’s greenhouse emissions relative to international climate commitments. To avoid the evident risk of overlooking or downplaying the need for climate action by the unnamed sectors, an obvious climate policy recommendation would be to redraft the core NPP statement for the NMP as soon as possible to target all territorial emissions and sectors. (Ideally, the NPP would also state a cumulative CO2 quota in aligned with the Paris Agreement, replacing the currently stated 2050 target, which could result in high total emissions depending on the pathway taken.) As research makes very clear, in the context of the Paris Agreement and the EU objectives, all sectors will need to target substantial and sustained emission reductions. Updating the National Mitigation Plan to include the missing emissions noted here, by targeting all sectors explicitly, would increase the coherence, effectiveness and ambition of Ireland’s climate action.